Long-time bloggler Josh Farlee has informed me that his son Dane is going to undergo heart surgery on Tuesday. Dane just turned three and he was born with aortic stenosis. He has already undergone two surgeries. You can read more about him by going to http://www.caringbridge.org and typing in danefarlee. It's pretty amazing. 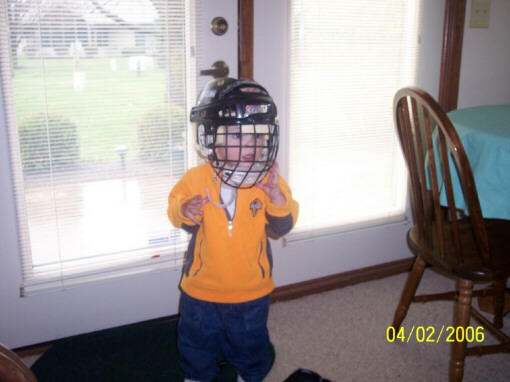 As you can see, Dane is ready to try to take the Komets' goaltending spot when training camp begins. Be assured that Dane will be in my thoughts and prayers today. Hope everything turns out well. You are in our hearts and prayers Dane! Good Luck! Good luck with your surgery Dane! Your buddy Brady says to get better fast, and he is already looking forward to watching some hockey with you next season. You are in our thoughts and prayers little buddy. best of luck in your surgury...Its tough to watch the little ones go thru all this...its definatly not fair..
like I said best of luck and you will be in my families prayers..
Best of luck from my fiance and I. You will be in our Prayers. You are in my prayers Dane, Good Luck and hurry and get better . The Komets will need a good goaltender. We are all with you .